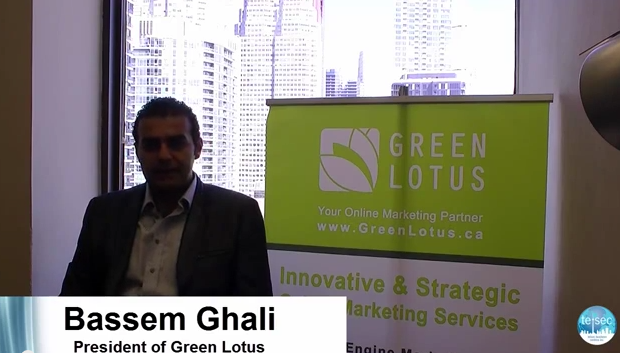 A few weeks back we interviewed Bassem Ghali of Green Lotus as part of our “Meet the Telsec Business Centres Community” program. Our hope is that through these interviews we can provide some business tips and networking opportunities for our current and future clients. Your name and your role in your organization? 0:13 Bassem Ghali: My name is Bassem Ghali. I’m the founder and head of clients strategy at Green Lotus. Green Lotus is an online marketing company. The major benefit of using Green Lotus service are the insights and strategies that we provide for our clients. The most important thing that we do is track and measure every conversion and every lead from every source that we get – so that at the end of the day our clients have a clear insight of the performance of their big campaign on each channel. That will help them to make better business decisions and formulate better strategies moving forward. 0:47 Ian: Why do your customers or clients prefer you over your competitors? 0:57 Bassem Ghali: Well, I’ve been so fortunate to manage some of Canada’s top companies’ marketing team such as Canadian Tire, Toronto Star and Direct Energy. I think over the last 9 years of my corporate life, I managed close to 20 million dollars in media buys, so that gives me quite the edge over other companies that do not have the same skill set. I basically manage strategies all the way from development to implementation and monitoring and managing so we’re a one-stop shop for all client marketing needs. 1:36 Ian: Tell me a little about Green Lotus tools. 1:42 Bassem Ghali: When we started Green Lotus, we noticed a huge gap in the market serving entrepreneurs and start-ups. There were no real SEO tools in the market that were first, affordable, and second, very effective. About 7 months ago we launched our SEO Green Lotus tools and within the first 3 months we got more than 700 users. The tools are basically a suite of 35 SEO tools all the way from key word research to the ability to check your ranking on 200-plus search engines – and also manage monthly and weekly ranking reports so you know exactly how effective your SEO campaign is. 2:29 Ian: What are the challenges your business has faced? 2:33 Bassem Ghali: Our challenge is every start-up’s challenge. The major one is managing resources on a budget. I think we’ve been successful managing our resources and doing things that really impact the bottom line of Green Lotus. We’ve grown our company’s brand awareness and network all the way from zero to almost 15,000 people in the last 3 years. We’ve managed to host more than 6 big events, hosting speakers from ABC News, Google, Canadian Tire and Go Daddy. All that has given us an advantage over other companies that we are more well known and are well trusted brands in the marketing community in Canada. 3:22 Ian: How long has your business been at Telsec? And what are the benefits you’ve gained from being in a business-centre environment? 3:34 Bassem Ghali: We’ve been with Telsec, actually, from day one. The first thing that grabbed my attention was the address. I really liked to have my office at 1 Young Street. Other than that, as soon as we joined Telsec, it was obvious that it was the right choice. We have the copy centre, the coffee, meeting rooms – all of that at your fingertips. The other thing about Telsec is that it’s very affordable for entrepreneurs and start-ups here in Toronto. You don’t have to manage your phone lines and printers or worry about office furniture. All of that cost is actually covered by Telsec for just a low monthly fee. I think it’s very feasible for a lot of entrepreneurs and start-ups in the city.